This product may have been discontinued, as it is no longer listed on the manufacturer's website. This analysis will remain available for historical purposes, but please note that this product may be difficult if not impossible to find for purchase going forward. Overall, Purina Beyond Superfood Blend Barley, Egg & Cranberry Recipe Dry Cat Food is a below average cat food, earning 5 out of a possible 10 paws based on its nutritional analysis and ingredient list. When evaluating a cat food, the first five ingredients can tell you a lot about the quality of a product as they make up the bulk of the product. Ideally, you're looking for quality protein sources with a minimum of cheap starches, fillers or by-products. Continuing down the ingredient list, look for ingredients that resemble real food with a minimal number of unpronounceable chemicals - the same as you would for human food. Note - a bolded ingredient in the above tables indicates it is one of the first five ingredients listed by the product manufacturer. 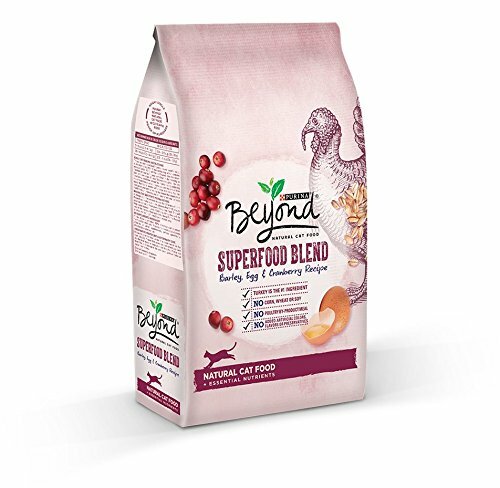 In this case, Purina Beyond Superfood Blend Barley, Egg & Cranberry Recipe Dry Cat Food's most plentiful ingredient listed is turkey, which is considered a quality protein source. It also contains chicken meal as additional quality protein sources. Additionally, Purina Beyond Superfood Blend Barley, Egg & Cranberry Recipe Dry Cat Food also contains as top ingredients brewers rice. These types of ingredients are typically used as bulk-adding fillers and are not required in your cat's diet. However, they are sometimes used to help maintain the kibble shape in dry foods. Allergen alert: This product contains beef fat preserved with mixed-tocopherols, fish oil and dried egg product which may be problematic for cats who suffer from beef, seafood or eggs food allergies. In general, cats have been shown to do better with a higher protein, medium fat, lower carb diet with sufficient moisture. However, specialty diets as recommended by your veterinarian may prioritize a different nutritional breakdown. Using the calculations provided by the AAFCO, Purina Beyond Superfood Blend Barley, Egg & Cranberry Recipe Dry Cat Food has approximately 357 calories per 100g (101 calories/ounce), which is fewer calories compared to the average of the other dry cat foods in the CatFoodDB. All the product information on this page is based on data collected from the manufacturer's product website as retrieved on October 6, 2018. The authoritative source for ingredient lists and nutritional analysis for any pet food is always the pet food manufacturer. Important Note: This product may have been discontinued by the manufacturer, as the above linked product website was no longer functioning when last checked. The manufacturer's published guaranteed analysis values normalized for moisture content. *Note that some nutritional percentages reported are only estimated values, and are indicated as such as (est). Each cat food manufacturer is required by law to publish a Guaranteed Analysis, which defines each product's maximum values of fiber, moisture and ash in addition to the minimum values of protein and fat contained within. Exact nutritional percentages are not available and hence all calculated values (including carbohydrate percentages and calorie amounts) are determined using these minimum and maximum published values and therefore may differ from actual values. Although a high score may be indicative of a higher-quality product it is not a guarantee. Similarly, a low score may or may not indicate an inferior product. The best food for your cat is the one that meets their individual needs.